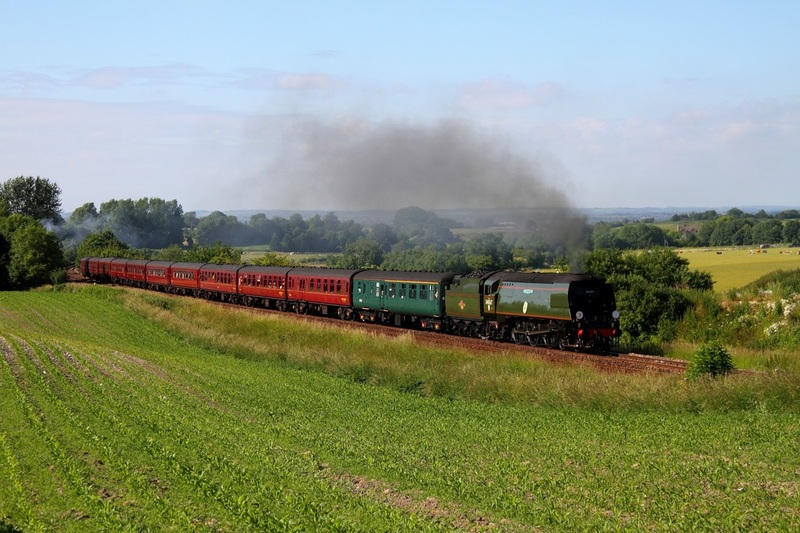 WCRC 33207 'Jim Martin' hauls LMS Class 5MT 4-6-0 no. 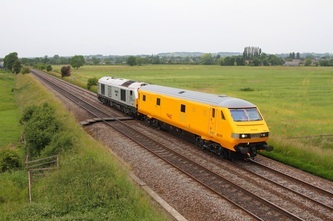 44932 at Upton Scudamore just north of Warminster nearing Westbury on the 29th June 2013, working as the 5Z81 Southall to Bristol Kingsland Road empty coaching stock move. 44932 (which moved from Carnforth to Southall via the WCML yesterday) replaces 70013 Oliver Cromwell on the Weymouth Seaside Express which operates on Sundays from Bristol Temple Meads to Weymouth and return. 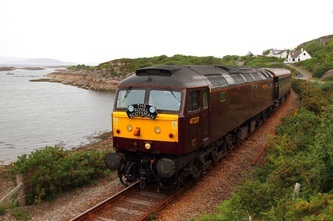 SR Light Pacific 4-6-2 no. 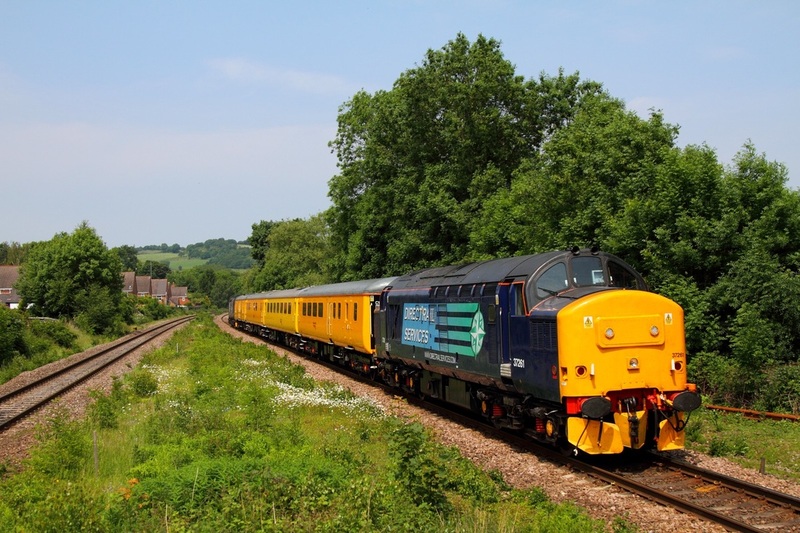 34067 'Tangmere' climbs the bank at Upton Scudamore nearing Warminster on the 29th June 2013, hauling the 1Z85 16:35 Bristol Temple Meads to Three Bridges 'Bristol and Bath' railtour. DRS 47501 'Craftsman' leads 47805 'John Scott 12.5.45 - 22.5.12' on the 1Z43 Aviemore to York Compass tours at Whitebridge, Druimuachdar on the 25th June 2013. 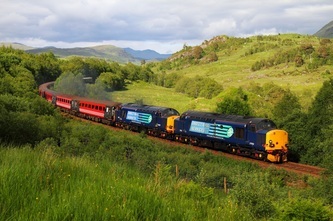 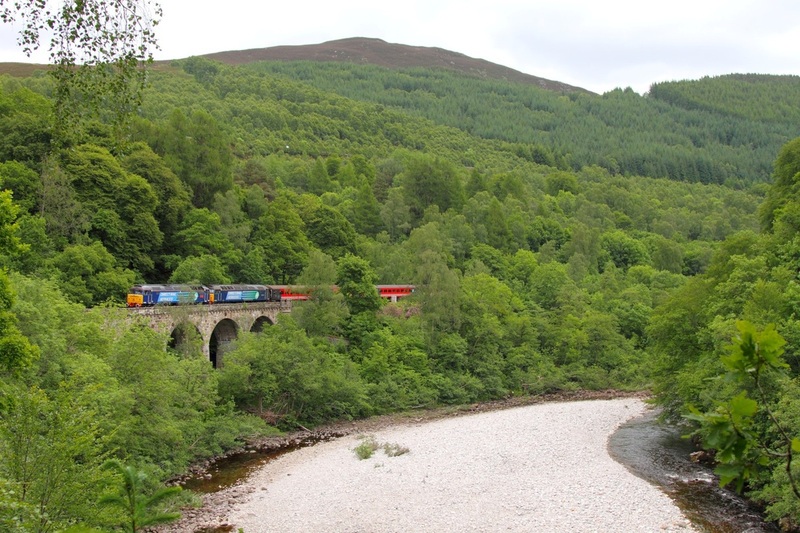 Below: 47805 leads 47501 over Killiecrankie viaduct near Blair Atholl on the 1Z42 York to Aviemore Compass tours on the 25th June 2013. 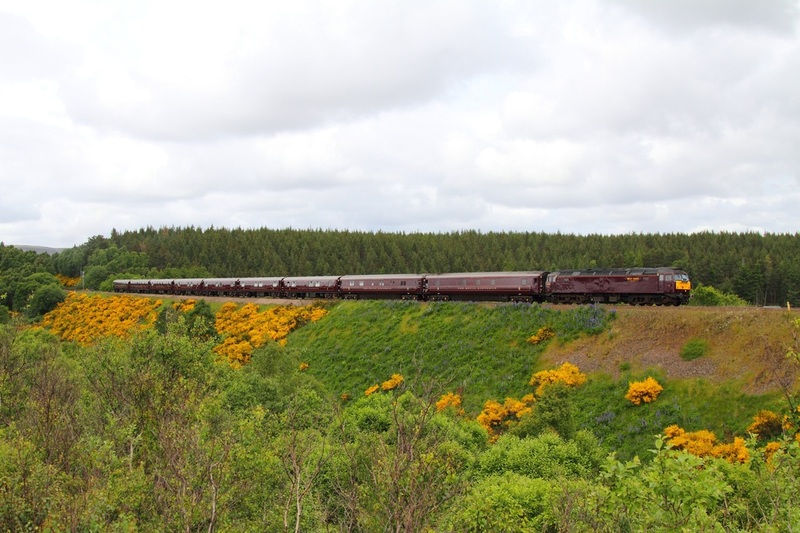 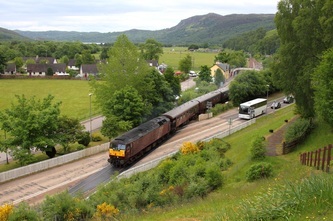 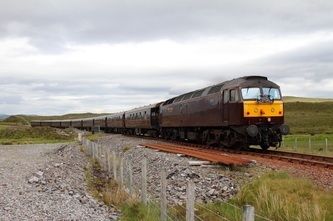 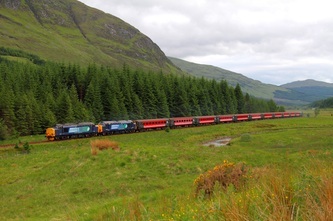 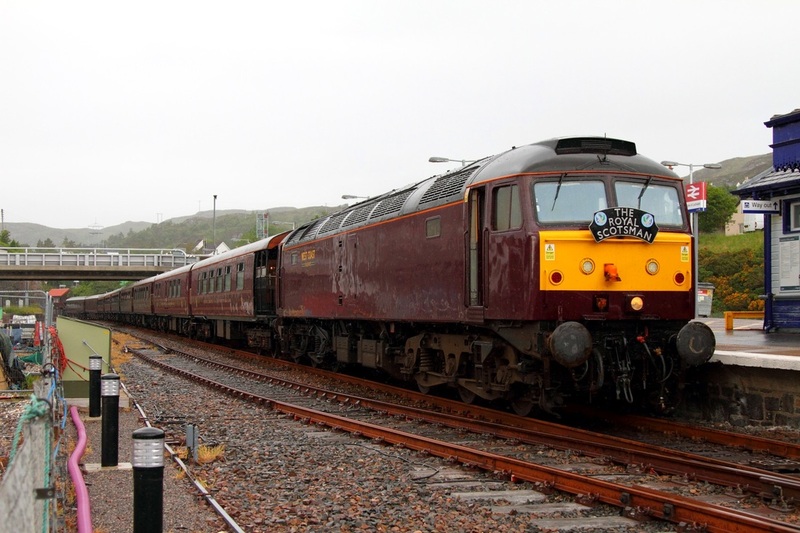 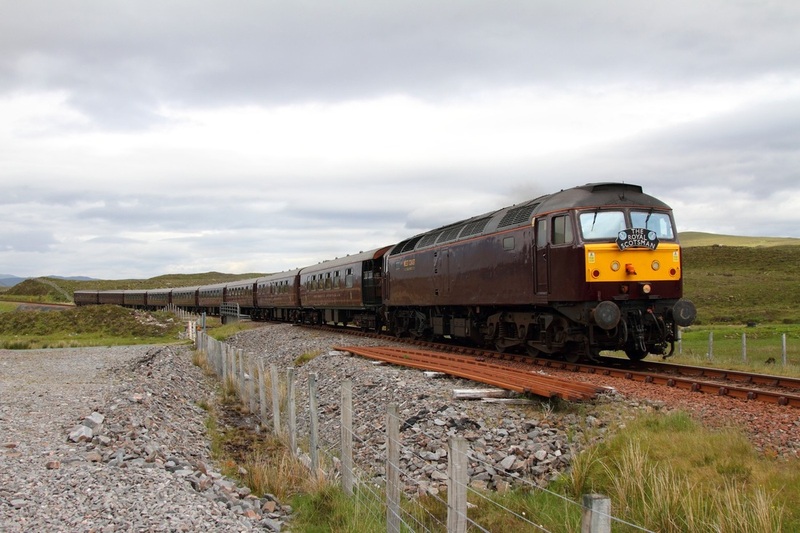 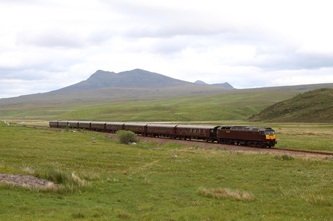 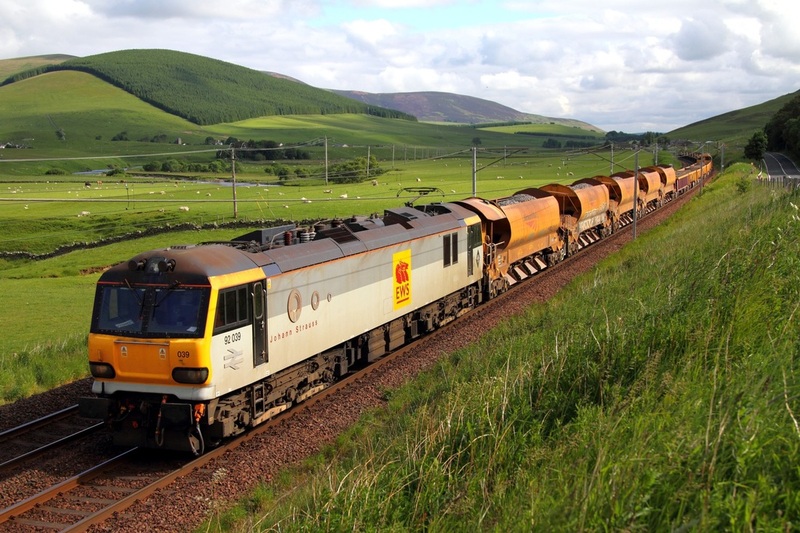 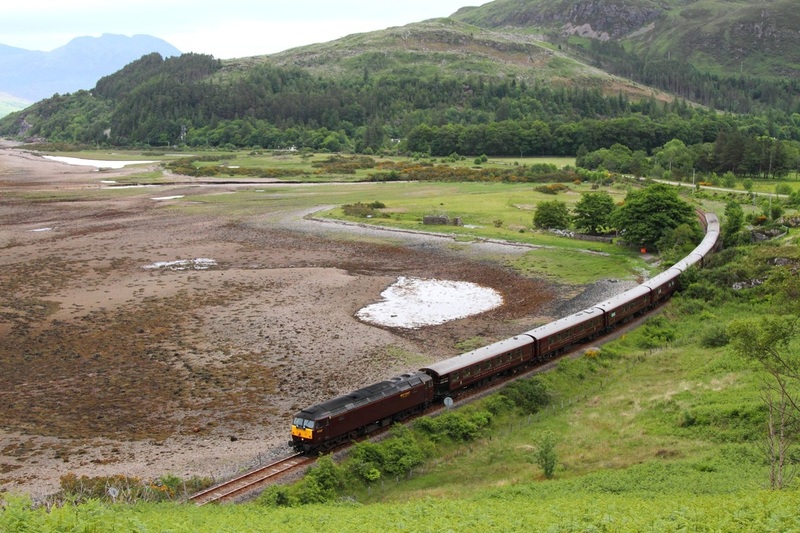 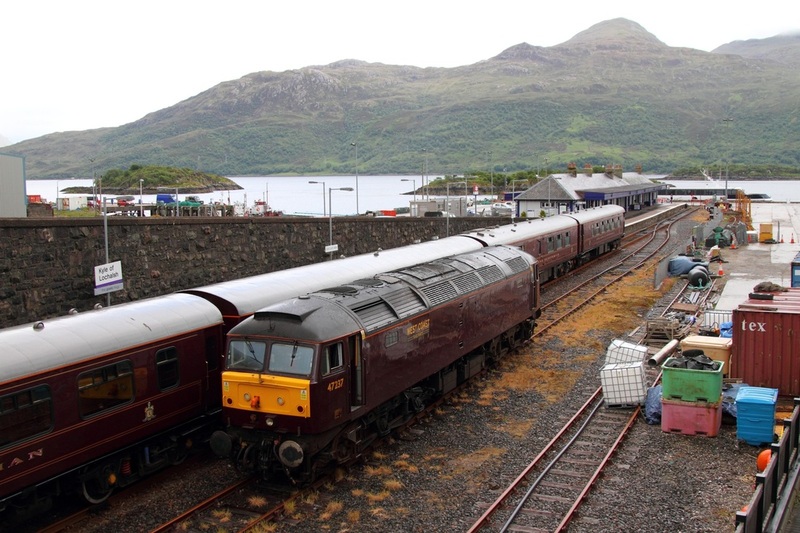 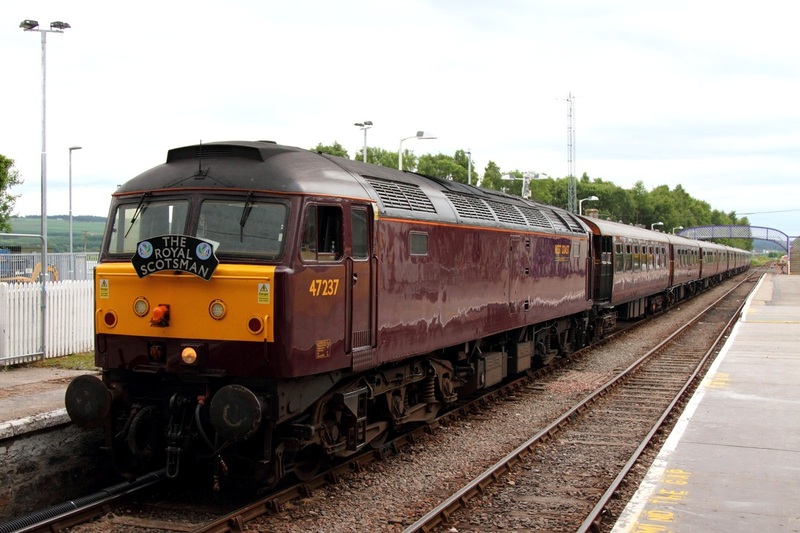 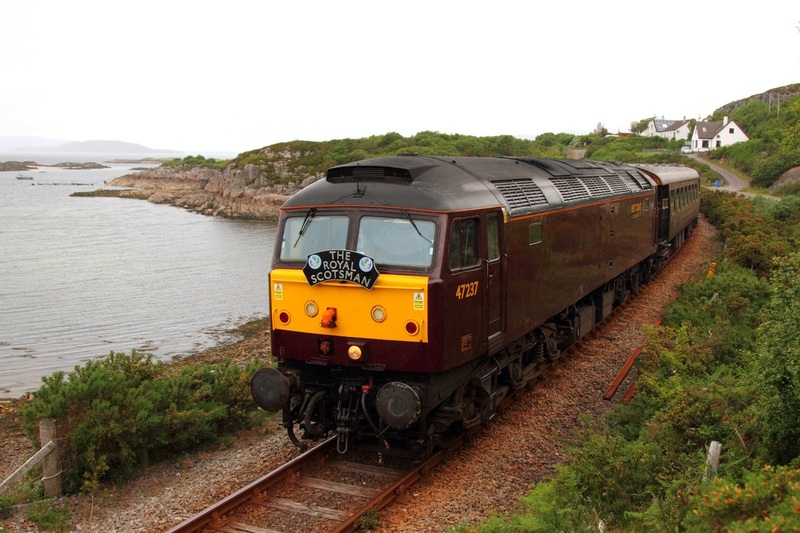 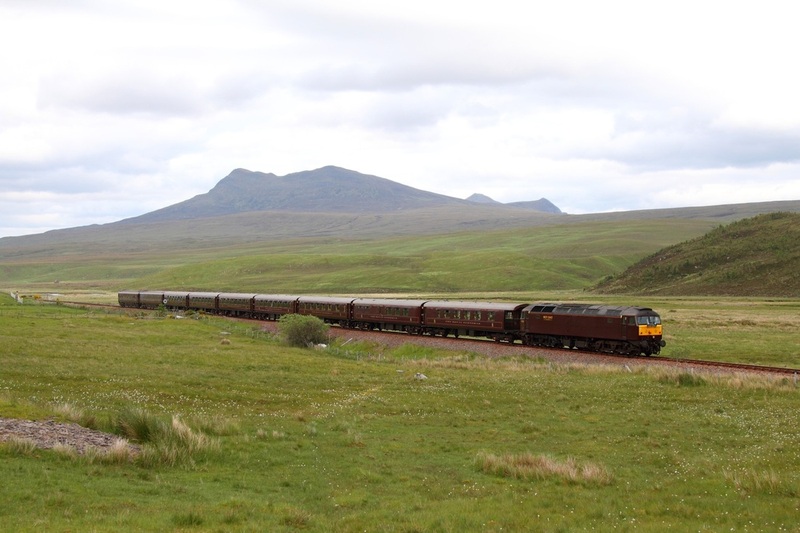 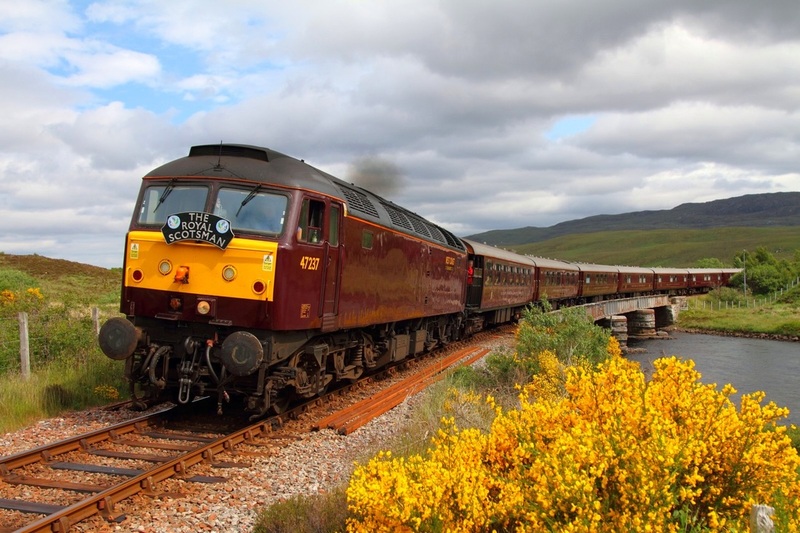 On the 25th June 2013, WCRC's 47237 leads the 1H80 Keith to Kyle of Lochalsh Royal Scotsman over Achnanalt viaduct. 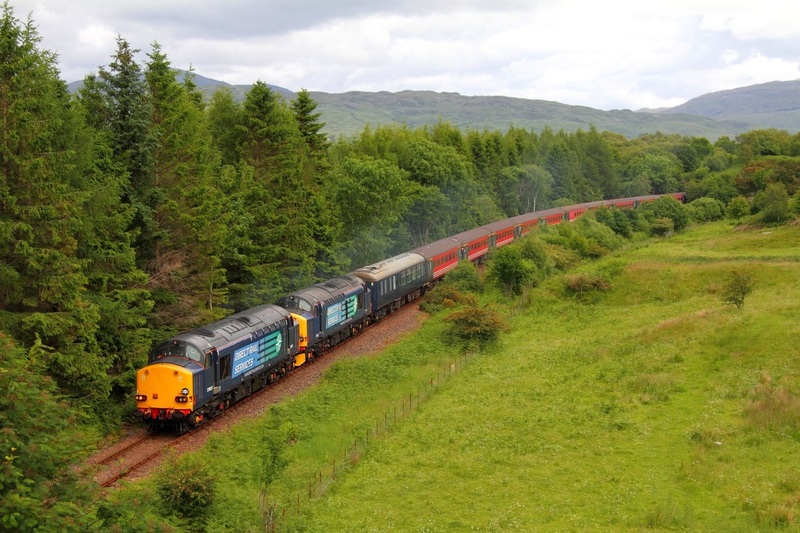 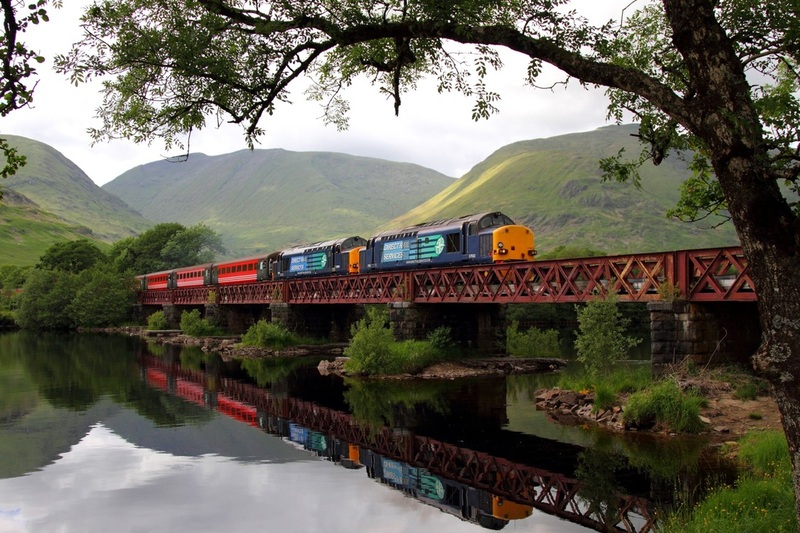 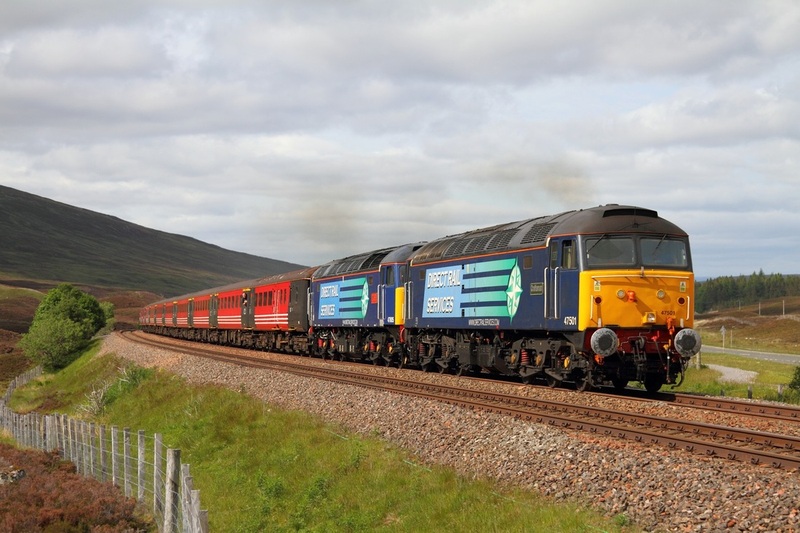 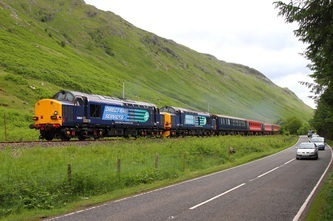 DRS 37602 leads 37607 on the 1Z34 Oban to Crewe Compass tours over Loch Awe viaduct on the 24th June 2013. 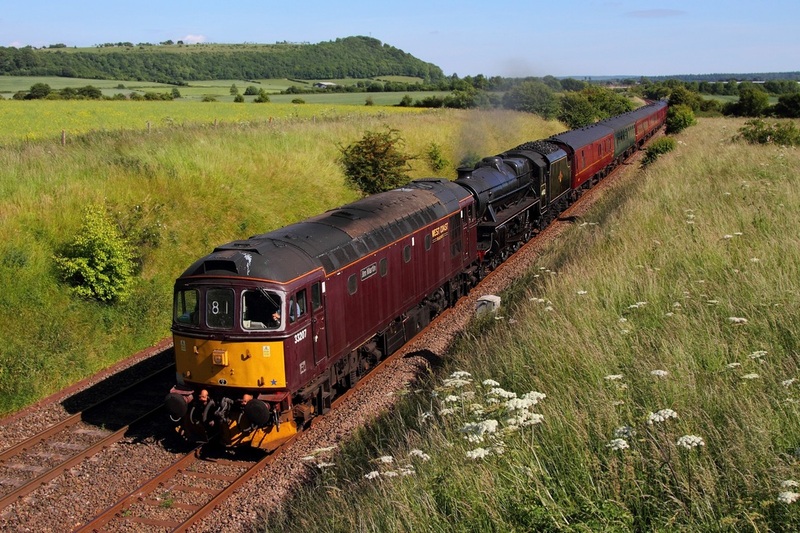 DRS 37423 leads 37409 on the 6K40 Carlisle yard to Rose Street (Inverness) engineers at Wandel north of Abington at the 24th June 2013. 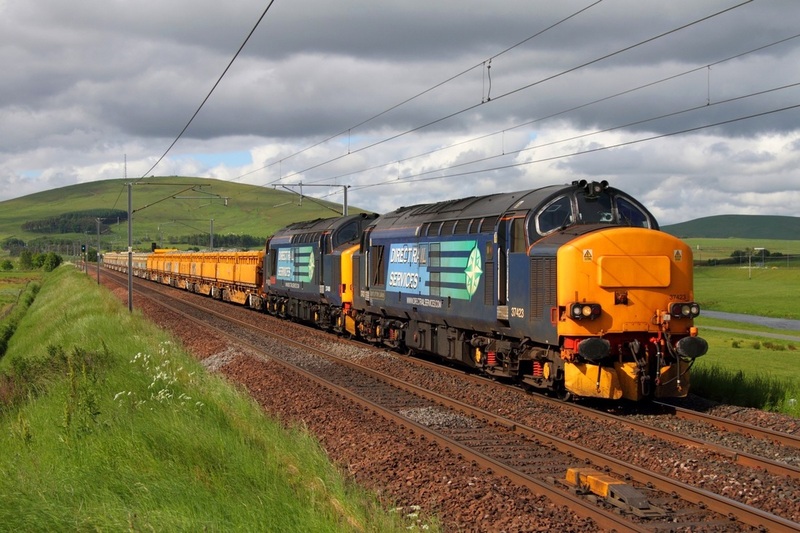 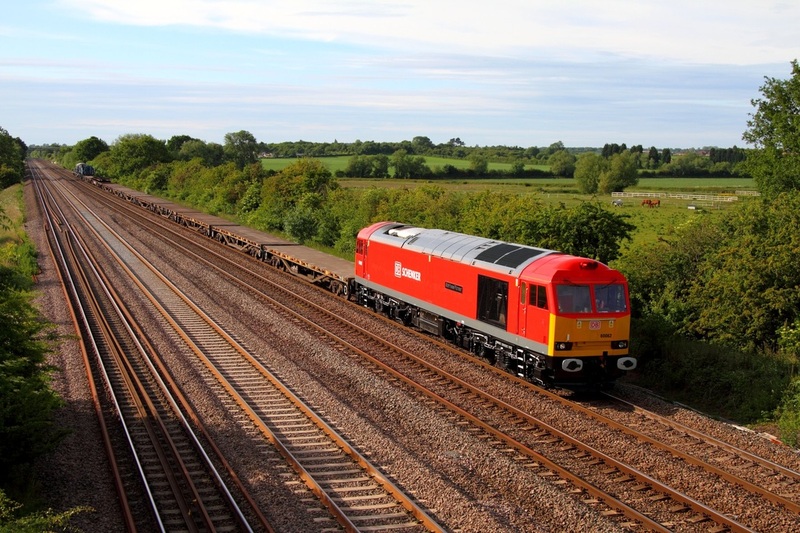 DB Schenker's 92039 leads the 6M49 Mossend to Carlisle yard engineers at Wandel north of Abington on the 24th June 2013. 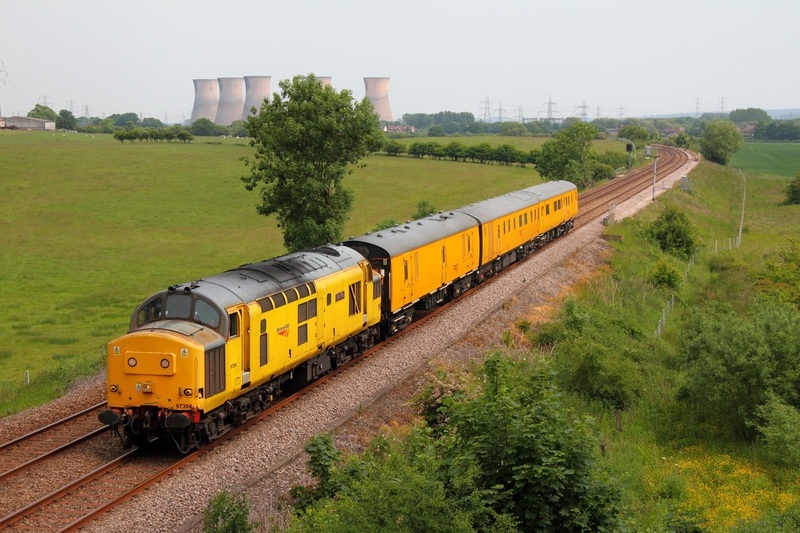 Network Rail's 31285 hauls 977974 as the 1Z16 Hither Green to Derby RTC at Barrow upon Soar near Loughborough on the 22nd June 2013. 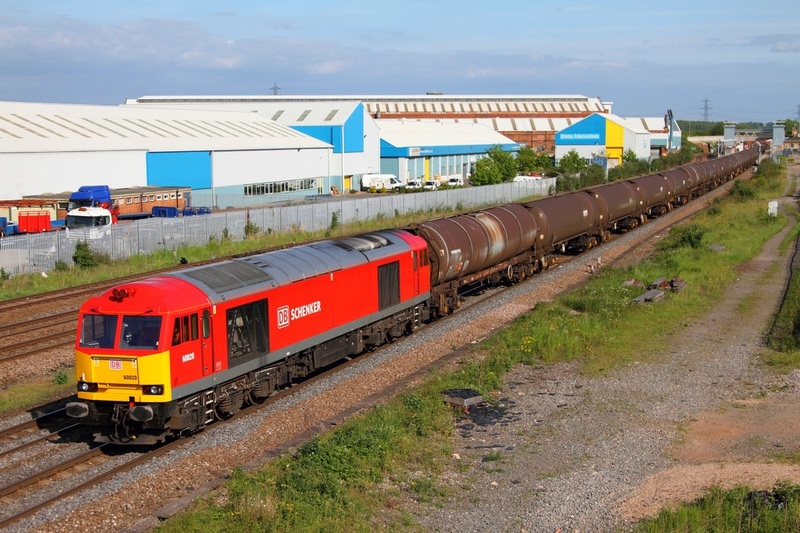 DB Schenker 60059 'Swindon Dalesman' leads former RFD liveried 90036, now sporting the DB Schenker Red colours at Claymills working as the 0G45 Toton to Bescot on the 21st June 2013. 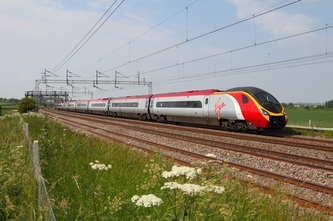 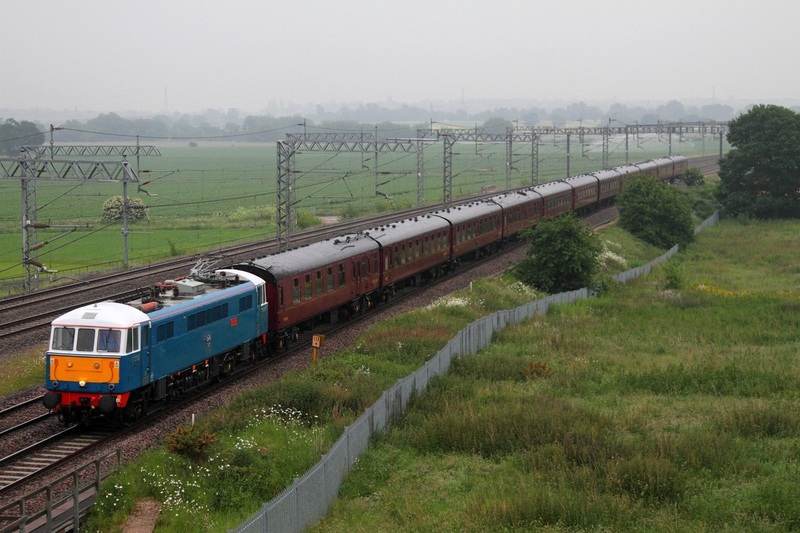 90036 was later hauled to Crewe EMD by 92001. 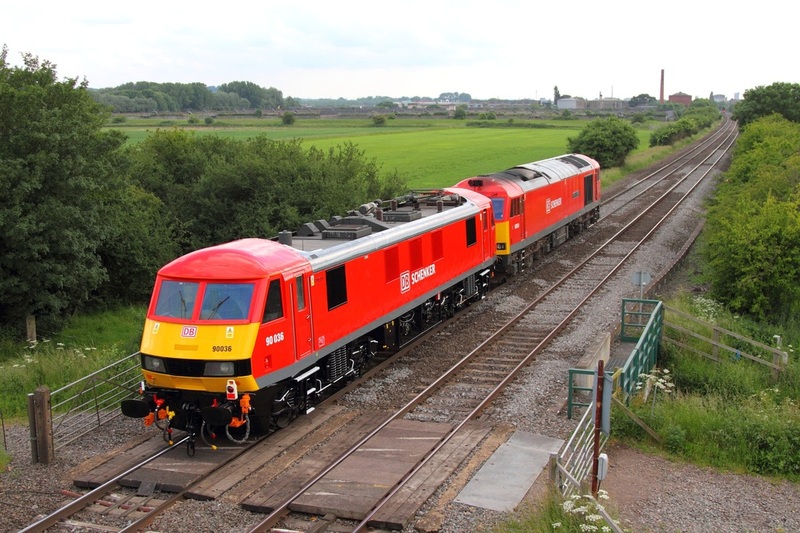 90036 now joins 90029 and 90018 which are both already in DB Schenker livery, bringing the total up to '3' DB Schenker liveried '90s'. 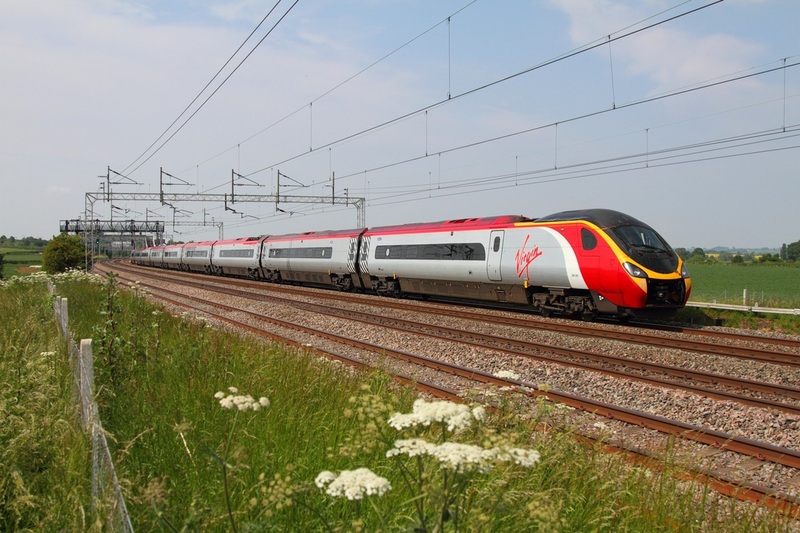 Either 90026, 90028, 90035 or 90039 are the next likeliest to be repainted. 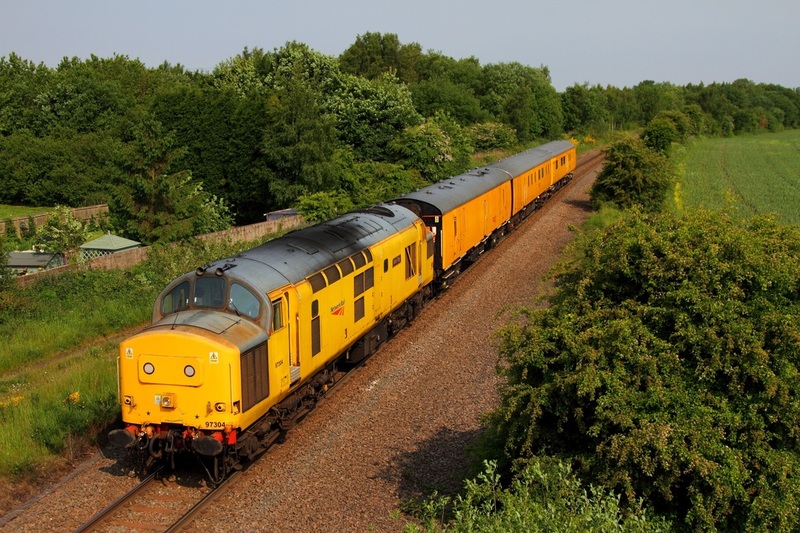 Colas Rail liveried 56302 leads 56105 on the 6E07 Washwood Heath to Boston at Chellaston on the 21st June 2013. 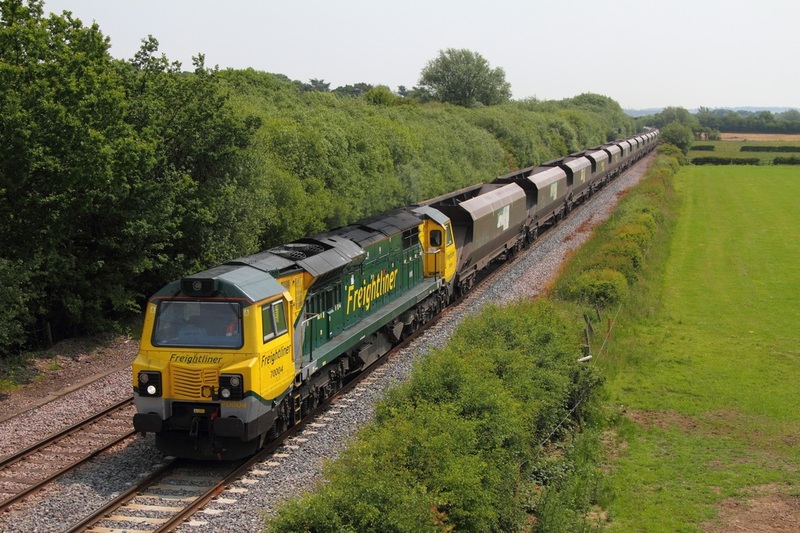 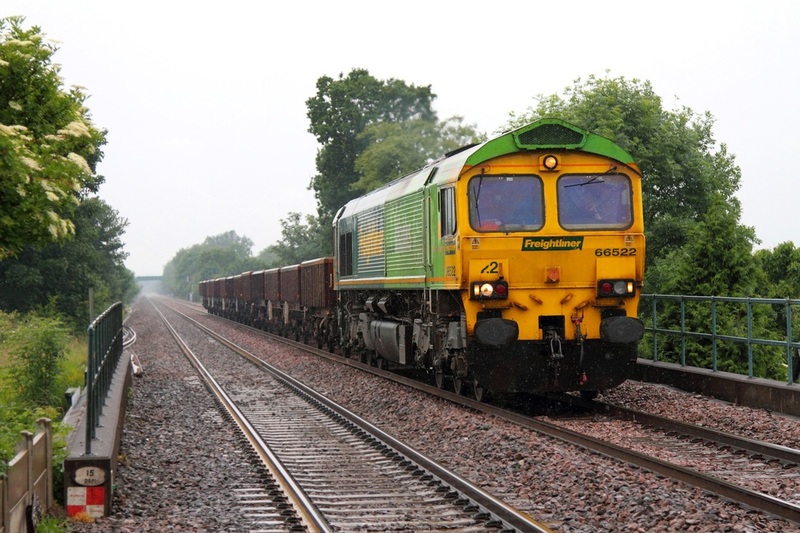 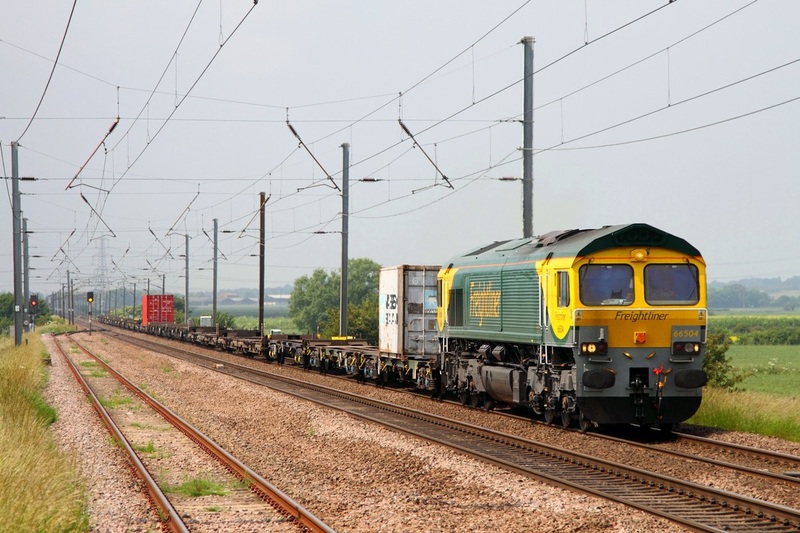 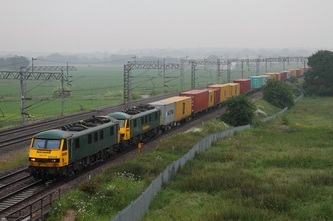 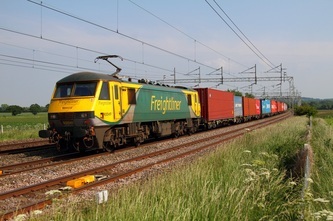 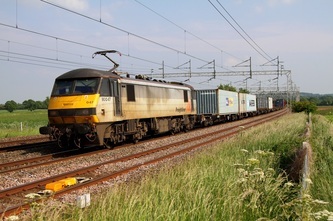 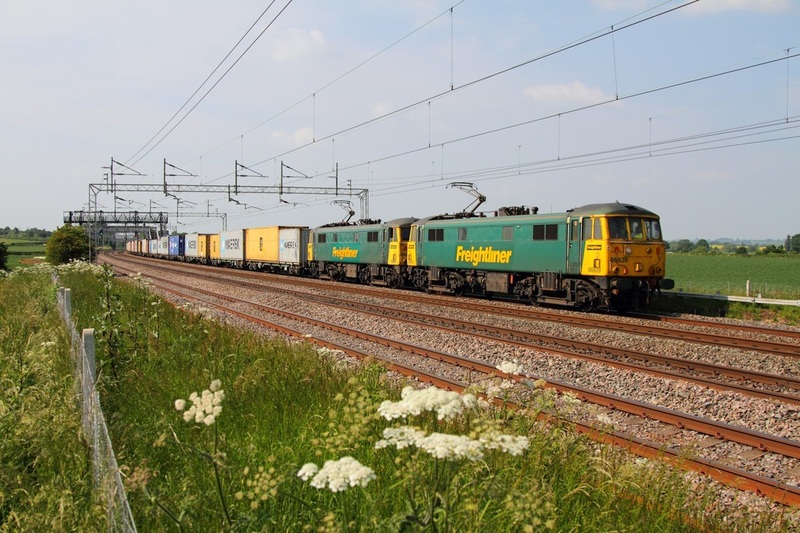 Freightliner's 66504 powers past Claypole working the 4L87 Leeds to Felixstowe on the 21st June 2013. In very soggy conditions, Colas Rail 47739 strolls through Willington on the Uttoxeter line approaching North Staffs junction with the 6M65 Grangemouth to Sinfin tanks (the spoon worked from Carlisle where it replaced 66850) on the 20th June 2013. 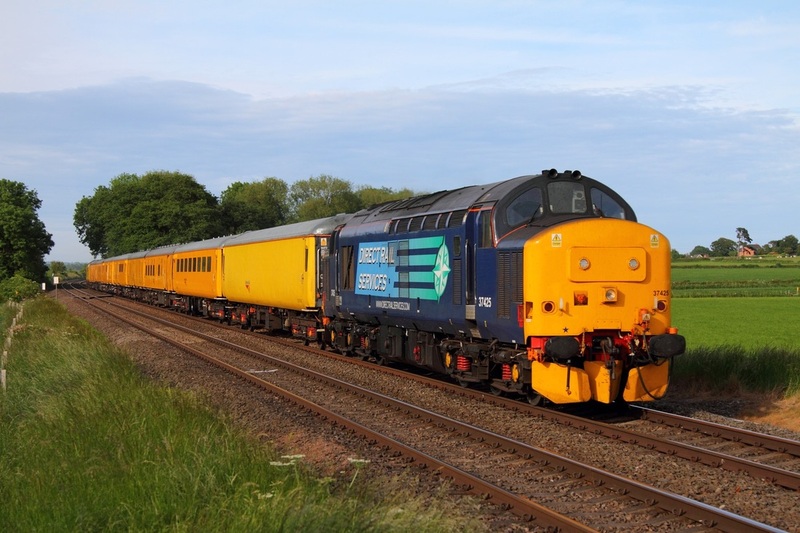 DCR 56312 hauls Rivera Blue liveried 50008 'Thunderer' at Tamworth working as the 0Z50 Washwood Heath to Barrow Hill on the 20th June 2013. 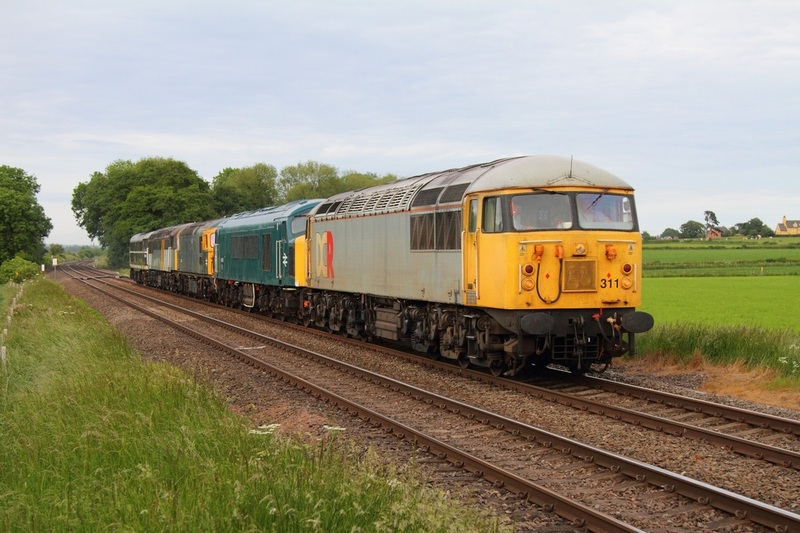 DRS 57008 in ex-works condition leads 57010 on the 4M44 Mossend to Daventry, sounding and looking tremendous at Grendon (just south of Polesworth) on the 19th June 2013. 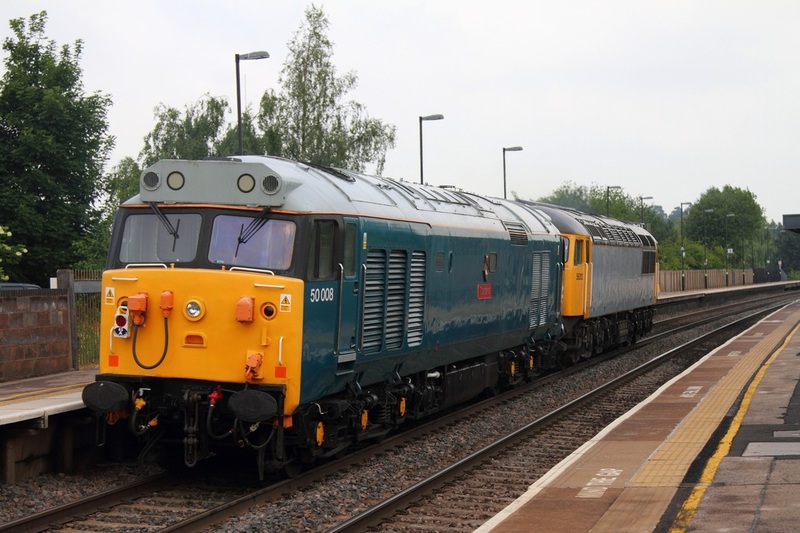 Unfortunately 57010 failed at Daventry and so the returning 4S45 was worked solo by 57008 as far as Crewe where 37402 and 37405 took over. 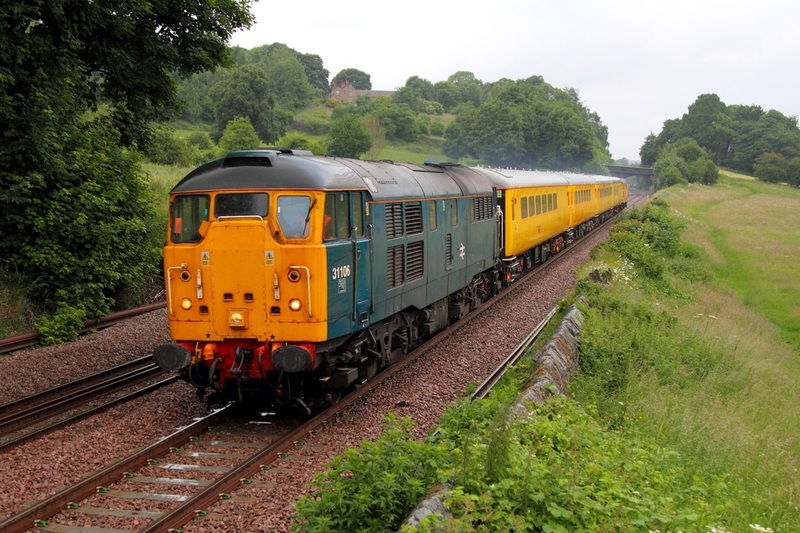 DRS 37261 leads 37194 on the 1Q60 Derby RTC to Derby RTC via Chesterfield and Barrow Hill (several trips) heading south at Duffield station on the 18th June 2013. 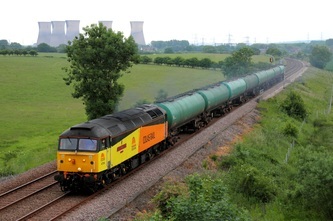 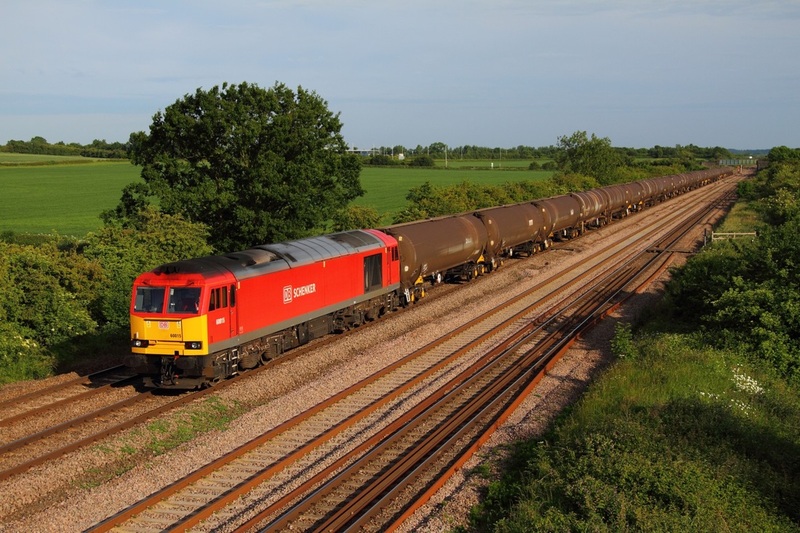 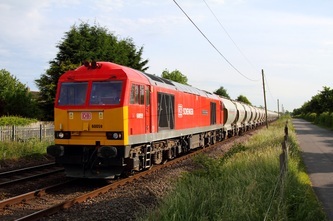 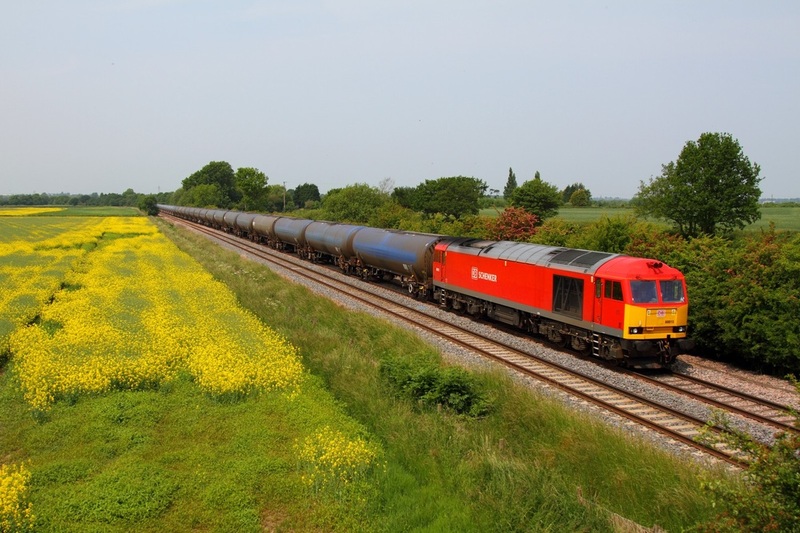 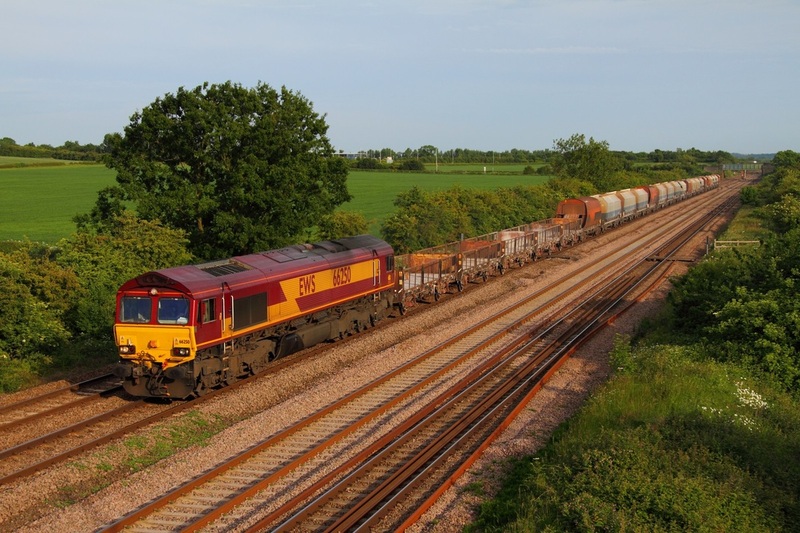 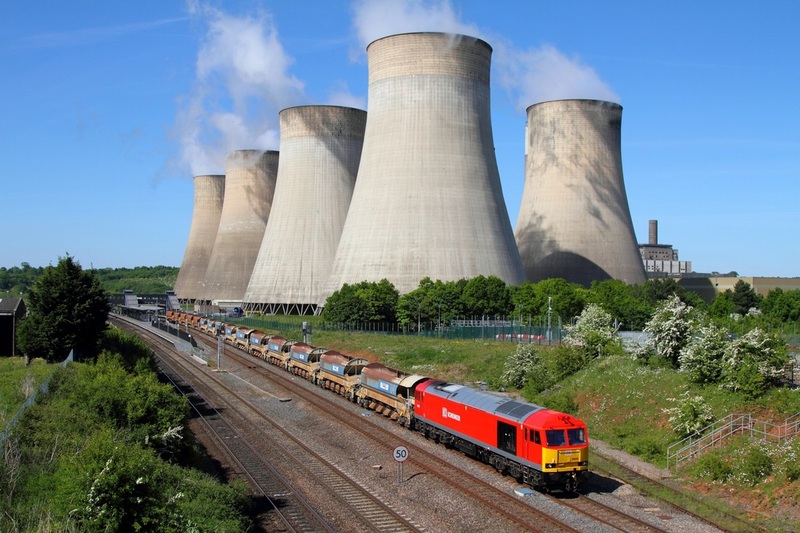 DB Schenker's 60015 works the 6E54 Kingsbury to Humber oil tanks at Barrow upon Trent on the 18th June 2013. 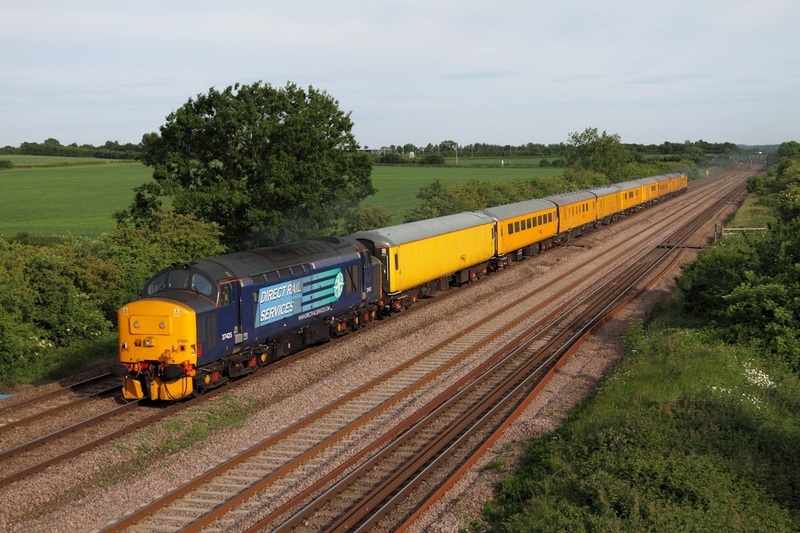 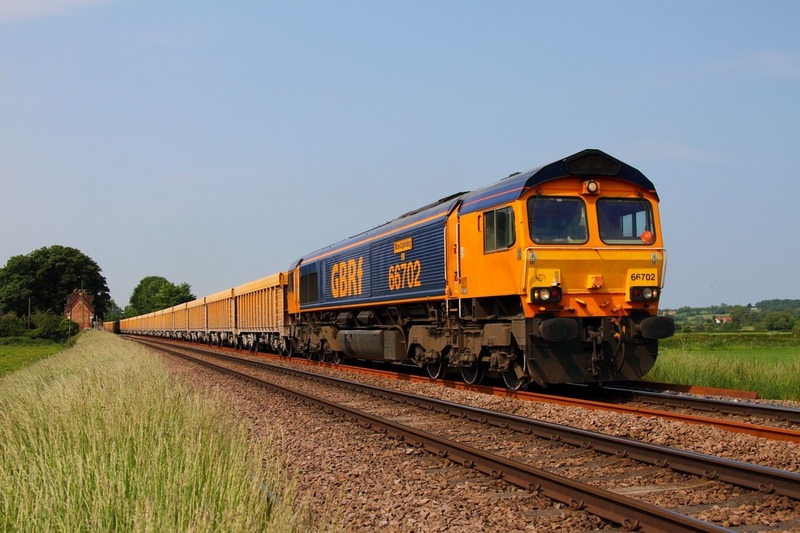 GB Railfreight 66702 'Blue Lightning' strolls through Rearsby east of Syston powering the delayed 6L76 Stud Farm to Whitemoor yellow box train on the 18th June 2013. 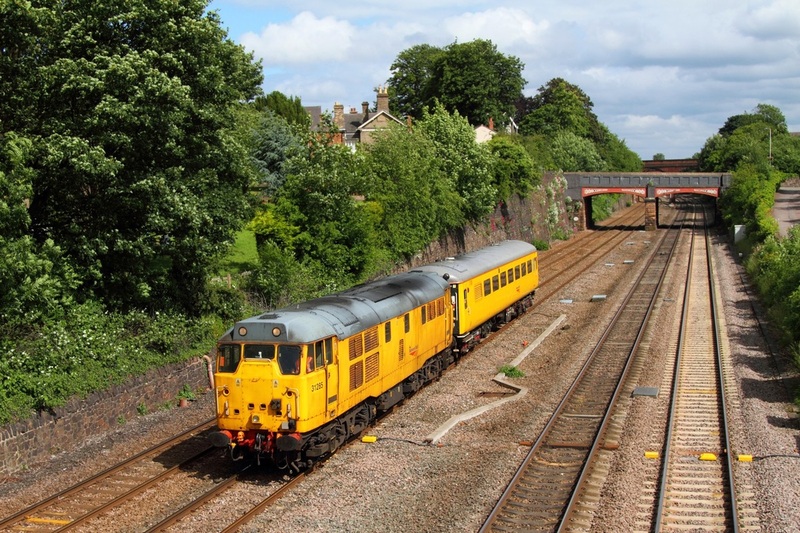 Network Rail's 97304 'John Tiley' formerly 37217 leads a 3Q36 Derby RTC to Derby RTC via the Coalville line through to Leicester and return, and secondly via the Uttoxeter line to Stoke and return. On the first leg of its tour, the growler approaches Bagworth on the Coalville line running about half an hour early on the 18th June 2013. 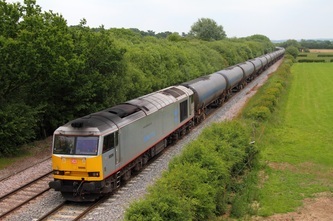 60062 which is the latest of the class '60' fleet operated by DB Schenker to have received re-engine refurbishment and is now sporting the striking DB Schenker colours. 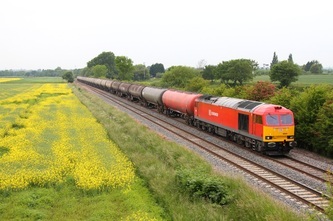 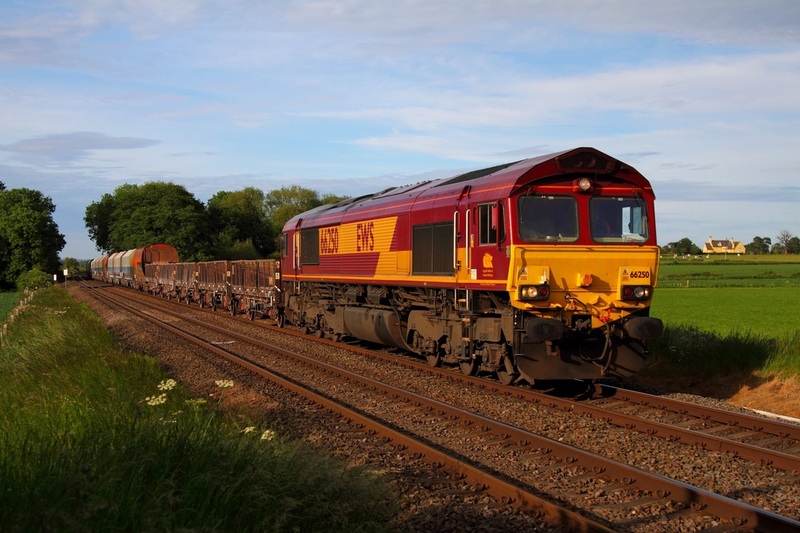 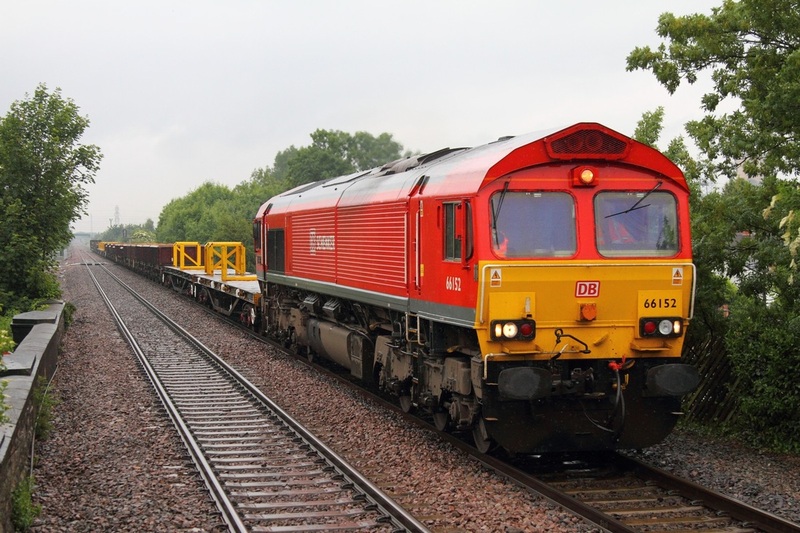 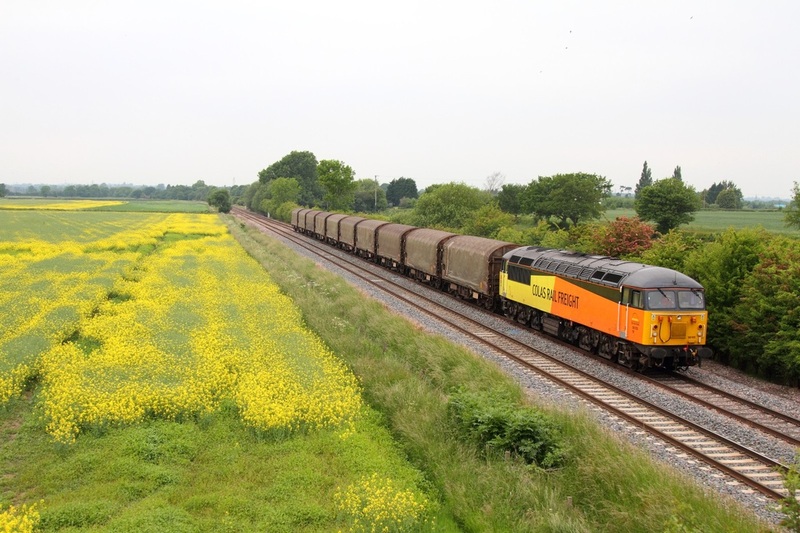 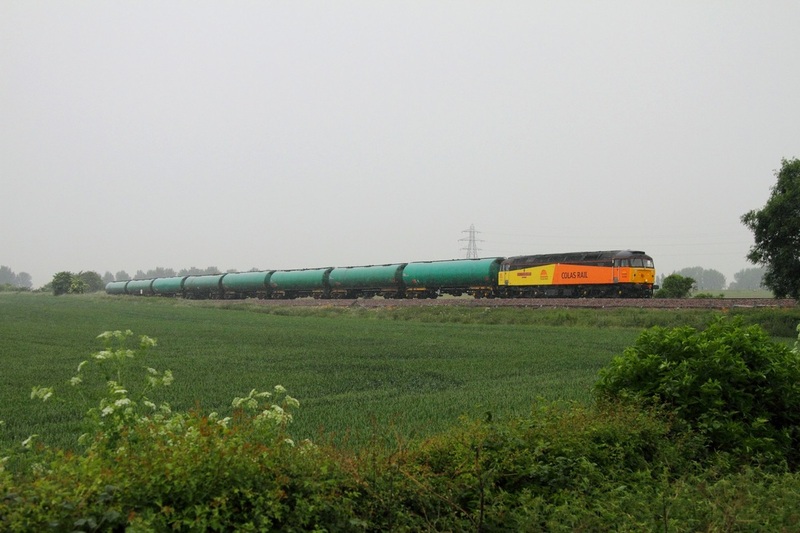 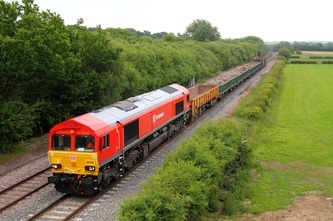 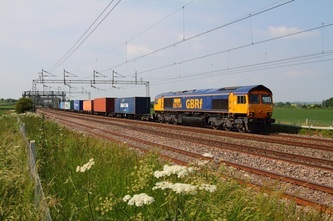 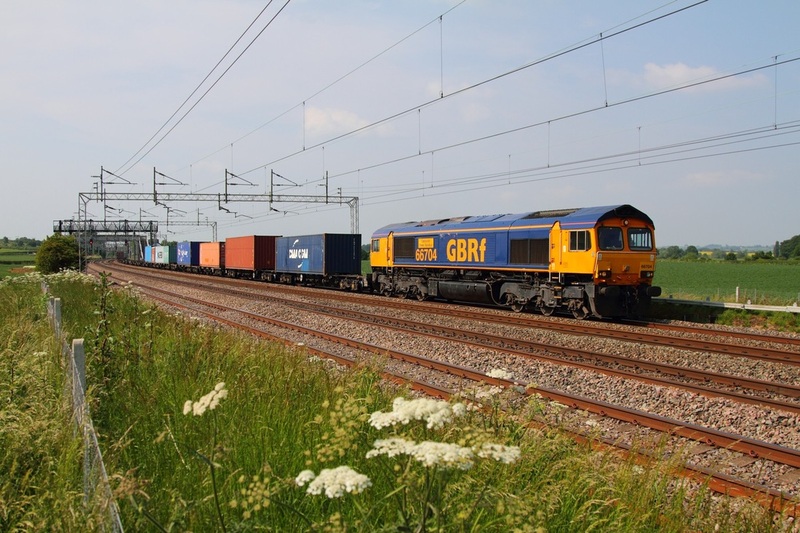 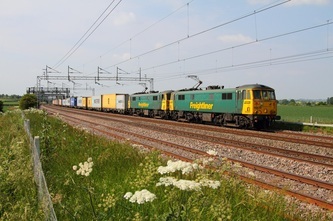 The Tug is captured here at Cossington running on the relief, on the approach to Syston, with 6L15 Toton yard to Whitemoor yard engineers on the 17th June 2013. 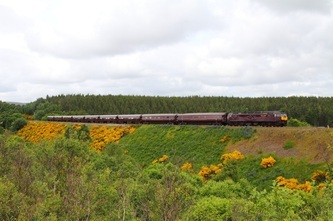 The locomotive has very recently be named 'Stainless Pioneer'. 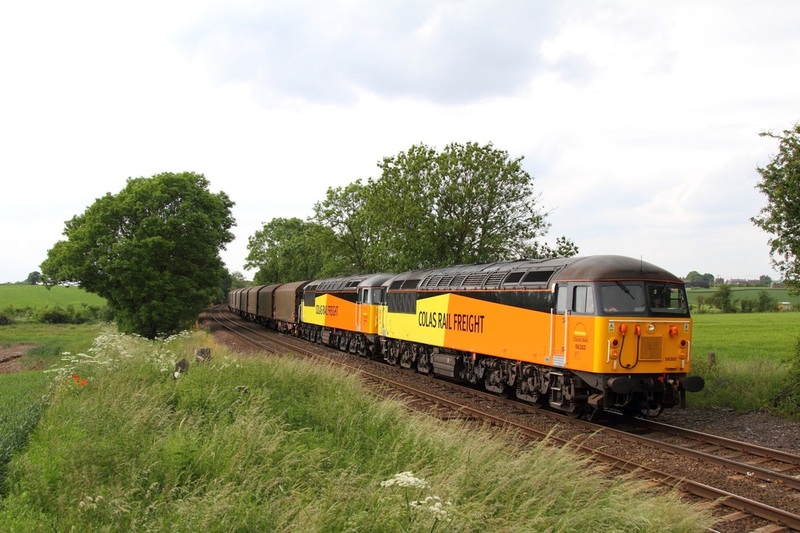 Below: A few photographs from a busy late afternoon/evening at Cossington and East Goscote including a further two class '60s', two '37s', 66250 and the North Norfolk Gala convoy return. 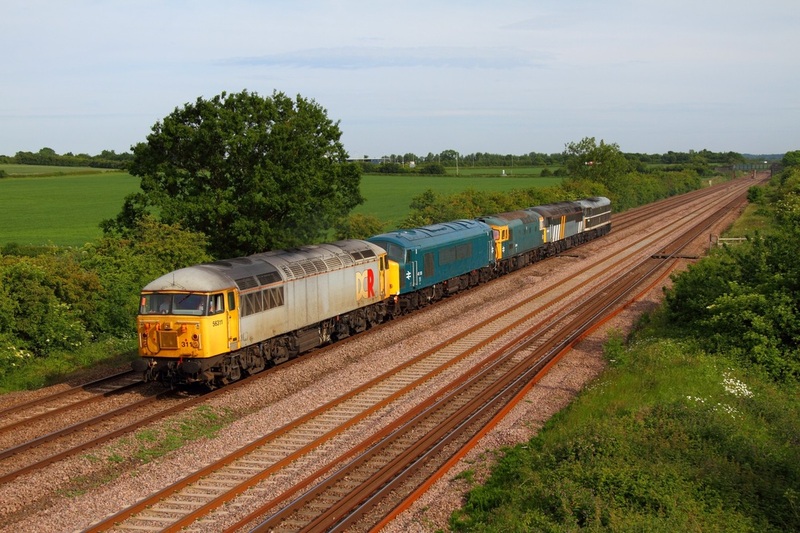 DCR 56311 leads Br Blue 45133, 33108, Fastline 56301 and Br Green 31190 on the 0Z20 13:00 Sheringham to Barrow Hill via Butterley at East Goscote on the approach to Syston junction on the Melton Mowbray line on the 17th June 2013. 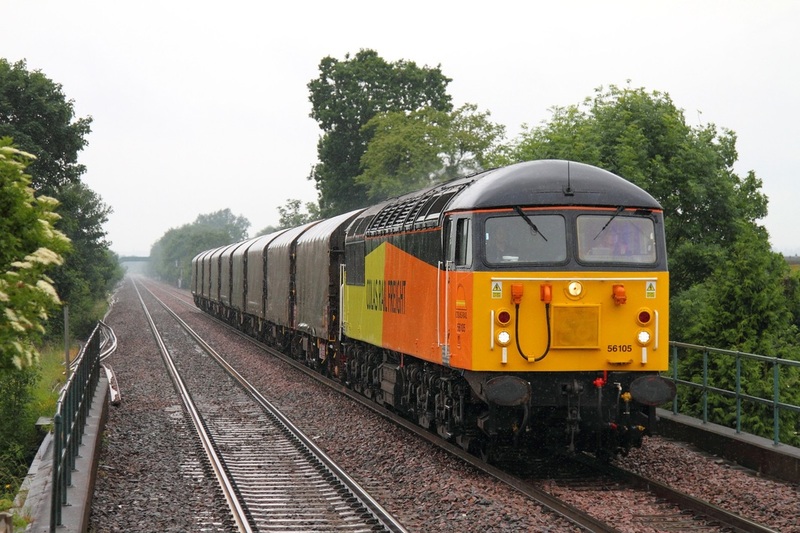 56311 was formerly 56057 'British Fuels' which was originally restored at the Nene Valley Railway before its return to the main line with BARS. 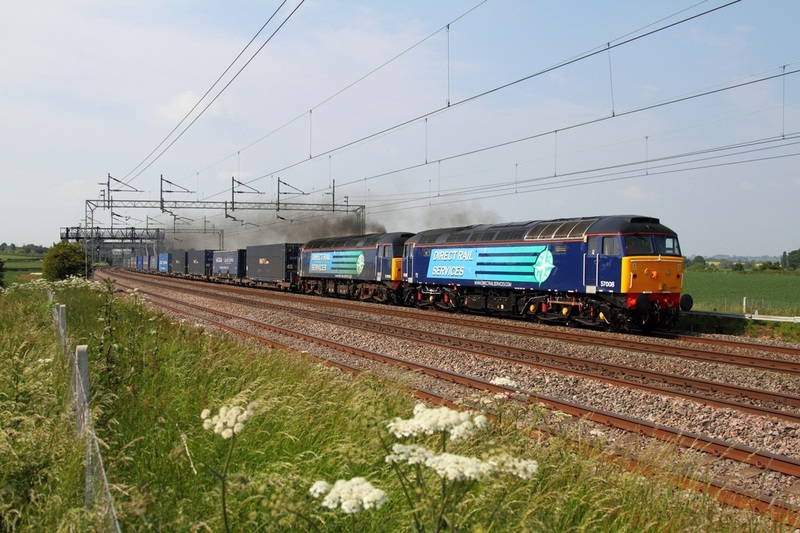 56311 returned south to Wembley as the 0Z56 07:31 Derby Station north junction to Wembley depot the following day on the 18th June 2013. DB Schenker's 60039 works the 6M23 Doncaster to Mountsorrel consisting of 15 autoballasters thru East Midlands Parkway adjacent to Ratcliffe power station on the 4th June 2013. 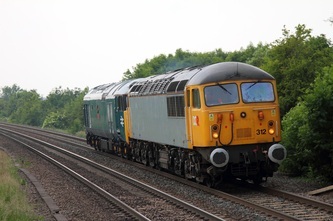 Many thanks to Phil Grain for his info on this working. 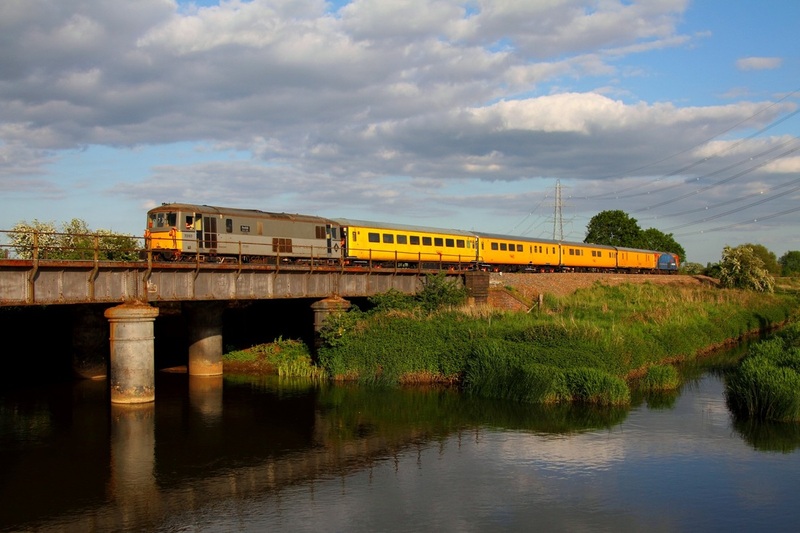 On the 2nd June 2013, Two Tone Grey liveried 73107 leads South West Trains liveried 73109 on the 5Z01 Cricklewood to Derby at Normanton on Soar just north of Loughborough on the 2nd June 2013. 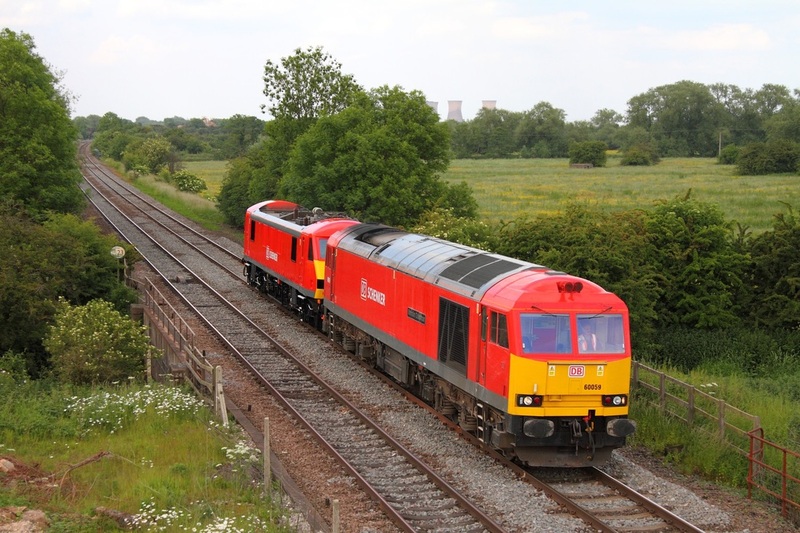 DB Schenker's 60020 leads the 6E38 Colnbrook to Lindsey tanks at Loughborough on the 1st June 2013.